Since I've been super busy lately and haven't had time to take any new pictures, so I've been going through some of my old pictures and trying to knock out some posts. 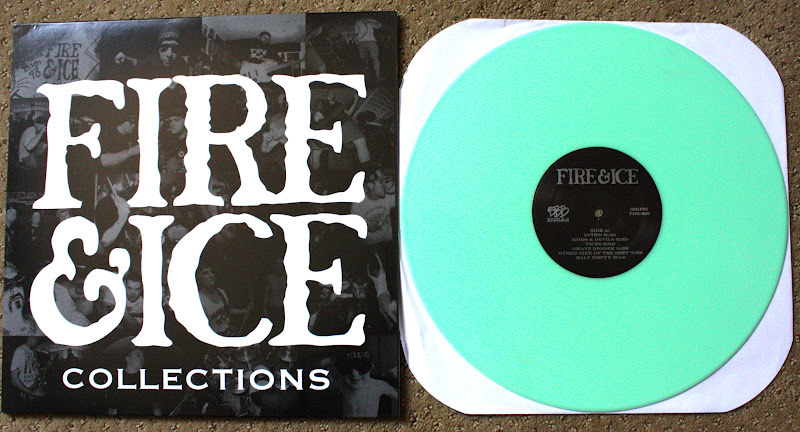 I actually took these back in March and have been sitting on a bunch of other records for one reason or another. 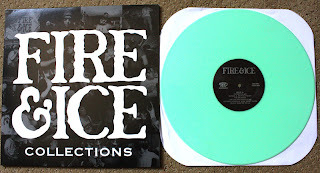 Fire and Ice is a band that has really been growing on me. At first "Not of this Earth" wasn't doing a whole lot for me, but it has really grown on me over time. It's turning out to be one of my favorite releases of 2012. 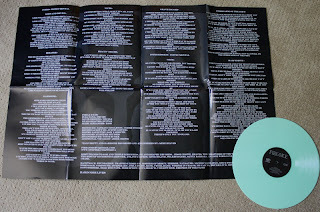 Above is my copy of "Collections" released by Triple B on glow in the dark vinyl /300, which is still available. This is the first glow in the dark vinyl I have ever owned and it looks really amazing. I had to hold it in the sun light to "charge" it for a while and then bring it into a dark room to check it out in its shining glory. It came with this huge poster as well with the lyrics on the back and a collage on the front. You can see just how big it is compared to the actual record. Triple B really went above and beyond on the packaging for this. Although "Not of This Earth" has grown on me, these tracks are still in the process of growing on me. They aren't as polished as "NOTE" and there are parts where the vocals kind of irritate me. I'm sure with more listening time I will enjoy it more. I remember John Joseph's vocals on "Age of Quarrel" annoying me when I first heard it, but little did I know it would end up being my favorite record of all time. We'll see where this one ends up.